Get to know our Brave Law Enforcement Officers! We are fortunate to have two very good sports supporting our Law Enforcement Torch Run holiday events every year! Once again, Det. 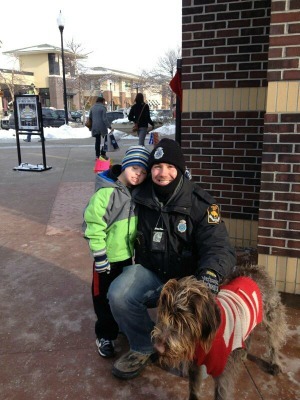 Kevin Wiese of Omaha PD and Ofcr. Seth Vanhorn of Kearney PD will be facing the elements in the bitter cold to raise money and awareness for Special Olympics Nebraska. Get to know a little bit more about these two heroes below. Detective Kevin Wiese has once-again bravely volunteered to be our officer behind bars for this year’s Cage-A-Cop event to be held December 20-22 at Village Pointe Shopping Center. The annual Cop-on-Top event is going down this weekend December 20-22 in Kearney at the Wal-Mart. Cop-on-Top consists of one very brave law enforcement officer spending a weekend (day AND night) living on top of the Wal-Mart, come snow or wild geese! And the officer isn't coming down until he's collected enough donations for Special Olympics Nebraska! This year that brave officer is Seth Vanhorn of the Kearney Police Department! This is Officer Vanhorn's 2nd year doing the Cop-on-Top. We chatted with him recently to learn what it's like living on top of a Wal-Mart for a weekend in the dead of winter. I met Officer Jeff Boston who is involved with the LETR at the UNK Police Academy. We did a Torch Run event at the academy and I’ve been involved ever since. I really like bowling and track. I’ve volunteered at bowling events in the past. Of course, the Cop-on-Top is my favorite! Being up on the roof of the Wal-Mart is exciting. I like to mess with people like telling them I’ll find them the best parking spot if they make a donation. It’s fun to joke around with the customers. This will be your second Cop-on-Top for Special Olympics Nebraska. Do you have any stories from spending a weekend living on the roof of a Wal-Mart? A lot of times, people will doubt you’re sleeping on the roof and holler up at you. One time, a huge group of geese flew over me in the middle of the night. I thought they were going to land on me! They were 3ft. from my tent! It was cold! It even snowed an inch or two and the visibility was poor. I couldn’t see beyond the parking lot. How much are you hoping to raise for Special Olympics Nebraska this weekend? I haven’t set a goal this year. I’m just hoping to raise as much as I can. How do you keep yourself busy up there? I love talking on the megaphone. It’s fun to interact with the crowd as they come in and leave the Wal-Mart. Sometimes they’re pretty shocked to see me up on the roof!